Super Model States: “Age is Just a Number! 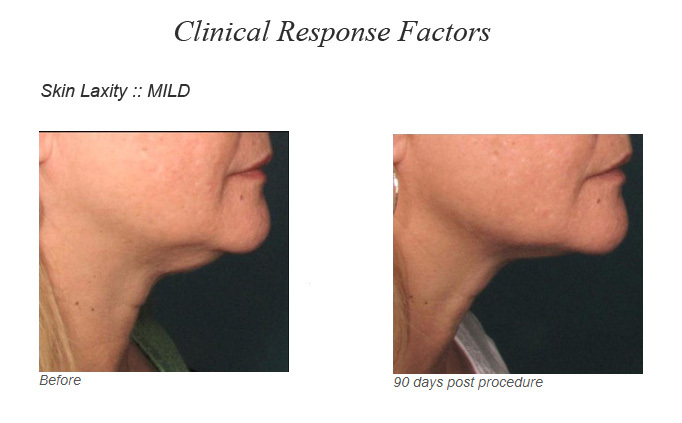 Ultherapy is the only non-invasive FDA approved procedure to lift skin on the neck, under the chin and on the eyebrow. Ultherapy is also now FDA approved to improve the appearance of lines and wrinkles on the décolletage. Ultherapy can help you achieve a fresher look from your brow to your chest! Ultherapy uses time-tested ultrasound energy to lift and tighten the skin naturally—without surgery or downtime. Ultherapy – Focused Ultrasound. No Surgery! First came fillers in the 80’s, then lasers, then Botox — all still useful in their own way. And there’s always been surgery. Now there’s Ultherapy® — a face and neck treatment that creates a brand new category in aesthetics—non-invasive tissue lifting. The FDA-cleared device, Ultherapy that is used in the procedure utilizes the safe, time-tested energy of ultrasound to stimulate the deep structural support layers of the skin—including those typically addressed in a surgical facelift — without disturbing the surface of the skin. In this world of immediate feedback, we want to reassure you that patience is a virtue, and results can take 2-3 months to unfold. Some patients have reported continued improvement for up to 6 months. While ultrasound does not duplicate the results of surgery, Ultherapy has proven to be an inviting alternative for those who are not yet ready for surgery. As the skin matures, collagen fibers that provide internal support become worn. Ultherapy’s ultrasound energy reaches deep below the surface of your skin to initiate your body’s own natural repair process. Over time, this results in the creation of new, healthy, strong collagen and a variety of positive skin changes. Because the rejuvenation process occurs naturally, results occur gradually. Just as strengthening muscles or growing taller takes time and is not evident from day to day, the effects of Ultherapy build slowly and subtly. How is Ultherapy different from other cosmetic procedures? 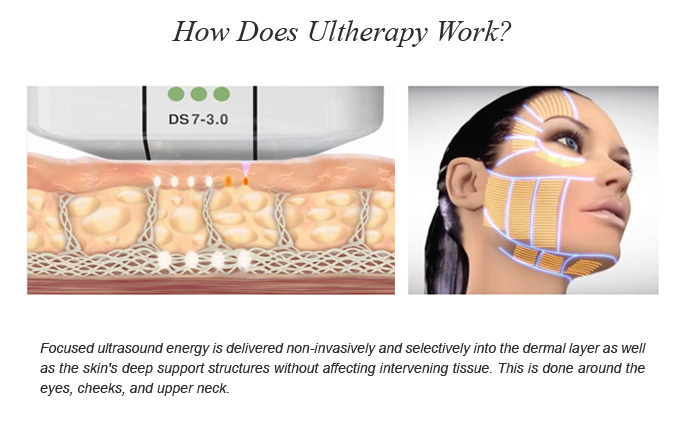 Ultherapy is the only non-surgical cosmetic procedure that uses ultrasound to specifically target the deep foundation below the skin – typically addressed in cosmetic surgery – without cutting or disrupting the surface of the skin.It also is the only procedure to use ultrasound imaging, which allows us to actually see the layers of tissue we target during the treatment and ensure the energy is deposited precisely to where it will be most effective. Does it hurt? Comfort thresholds vary from patient to patient, but there can be some discomfort while the ultrasound energy is being delivered. This is temporary and a positive signal that the collagen-building process has been initiated. We take measures to make the experience as pleasant as possible [customize based on practice’s comfort management protocol (e.g. pre-medication, cooling fans)], and patients tell us they leave comfortable and excited about the benefits to come. How long does it last? Patients treated with Ultherapy still have fresh young collagen after a year’s time following the procedure, but skin continues to age. Future touch-up treatments can help keep pace with the aging process, which varies by individual. Are there any side effects? There may be slight redness for up to an hour or so following the treatment, and a small percentage of patients may have slight swelling, tingling or tenderness to touch, but these are mild and temporary in nature. How much does it cost? Patients can expect to pay between $1000 and $5000. Of course, the cost of Ultherapy can vary depending on the extent of the treatment. It also can vary by geographic location and physician practice [customize depending on practice’s pricing]. This meets the demand for something between skin creams and surgery. The procedure has been cleared by the FDA after demonstrating safety in clinical studies, and tens of thousands of treatments have been performed safely worldwide. In addition, ultrasound energy has a proven track record, with use in the field of medicine for more than 50 years. How many treatments does it take? 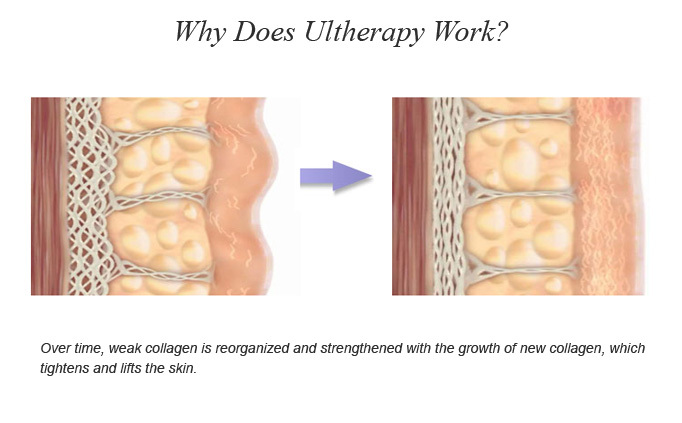 The majority of patients only need one Ultherapy treatment; however, some may benefit from more than one treatment (depending on how much laxity they have and their body’s own biological response to the ultrasound and the collagen-building process). Who is a good candidate for Ultherapy? A good candidate for Ultherapy is someone with skin that has “relaxed” to the point of looking, and often feeling, less firm. A lowered eyebrow line or sagging skin on the eyelids, for instance, is often the first sign of “maturing” skin. Typically, those in their thirties and older who have mild to moderate skin laxity are candidates. While Ultherapy is not a replacement for a surgical face lift, there are many people who want some lifting but are not ready for surgery, either mentally, financially or logistically. There also are younger people who want to “stay ahead of the game” as well as those looking to prolong the effects of cosmetic surgery. What about treating anatomical regions other than the face? Currently, Ultherapy is a treatment for the face with a specific clinical indication for eyebrow lift. What does collagen do? How does Ultherapy stimulate the creation of collagen? Collagen is a natural protein that gives skin its youthfulness by keeping it firmed and toned. As we age, collagen loses its strength and its ability to stand up to the effects of gravity that pull the skin downward. Ultherapy jumpstarts a repair process that strengthens your existing collagen and produces fresh, new collagen. Can men have it done? Yes! Both women and men globally are receiving Ultherapy. What kind of result can I expect? With just one treatment, the regenerative process is initiated, but the full effect will build gradually over the course of two to three months. Some patients may benefit from more than one treatment. Visible effects include a lifting and toning of sagging skin. In the FDA clinical trial for instance, nine out of ten patients had a noticeable, significant lift of the brow line. This resulted in reduced skin laxity on the eyelid and a more open, youthful look to the eyes overall. Patients reported firmer, better-fitting skin in other areas of the face and neck as well. There is also an invisible result from the procedure with the creation of new collagen, which can help to slow the degenerative process. See why 1 Million procedures have been performed worldwide, Book your Ultherapy Consultation Today! The Ultherapy Glow Treatment is a non-surgical, ultrasound treatment specifically designed to counteract the effects of gravity on your skin. By sending ultrasonic energy to various layers of the skin; Ultherapy initiates your body’s own healing-response which leads to lifting and tightening of your skin. Traditional Ultherapy treats the lower levels of the dermis (4.5 mm and 3 mm), and the Ultherapy Glow treatment targets the superficial layers of skin (1.5 mm). The 1.5mm depth of energy can be used all over the face, décolletage and is most effective at smoothing fine lines and wrinkles in areas of thinner skin such as the crows’ feet and upper lip lines. 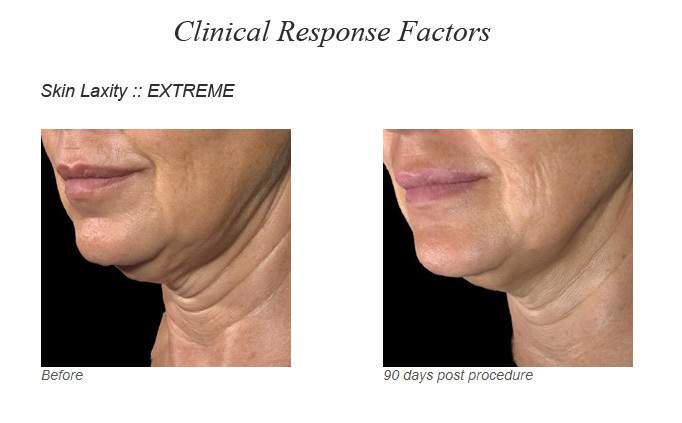 As we age and collagen levels decrease, sagging, crepey skin becomes more apparent on the neck rather than the face. The Ultherapy Glow 1.5 Transducer depth will target only the superficial layers of skin, lifting the thin skin while increasing collagen production. This in turn will firm up wrinkles and crepey skin. What Does Ultherapy 1.5 Glow Treat? Ultherapy Glow treats large pores, fine lines, crepiness and uneven skin texture. What Parts Of The Face Can Be Treated? Ultherapy Glow can treat the entire face and décolletage. Most patients see an immediate glow right after the treatment. Optimal tightening will appear in 3-4 months post-treatment and lasts for about a year. 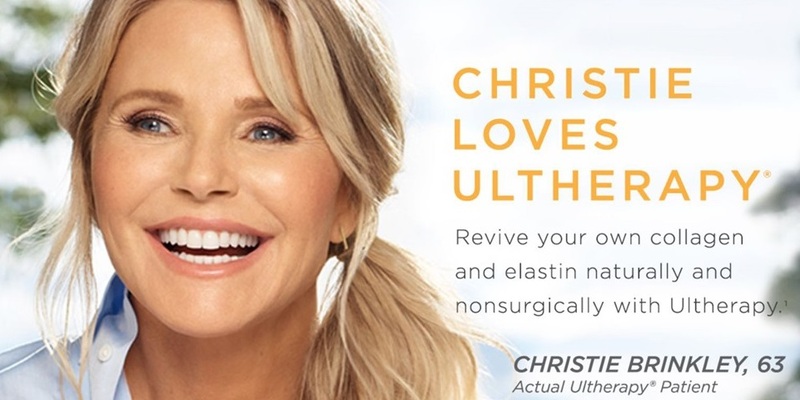 In contrast to laser resurfacing treatments, Ultherapy is designed to leave the most superficial skin layer unharmed, so there is usually no downtime with this treatment. There is some minimal pain associated with the treatment, however numbing cream or pain medication can help to alleviate the discomfort. How Long Does An Ultherapy Glow 1.5 Treatment Take? One to two hours, depending on the number of areas being treated. Usually we recommend one – three treatments spaced a month apart. Because the Ultherapy Glow treatment only treats the superficial layers of skin, it is safe to do more frequently than traditional Ultherapy.